Special units require highly specialized gear that can often be bulky and expensive. Your department has invested a significant amount of funds in these assets, so be sure to give them careful consideration during the planning and design phases of new construction. Spacesaver’s lockers and other special units storage systems are engineered and manufactured in the USA, so they can be custom designed to keep valuable gear accessible and secure. 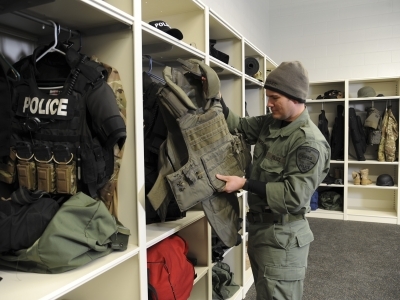 Help officers store gear at the point of use with thoughtfully designed locker layouts. Our configurable lockers store helmets, boots, duty bags, and other gear, keeping all items secure and close at hand. We offer a wide variety of standard and custom tactical gear locker configurations to accommodate vests, shields, helmets, and other gear. 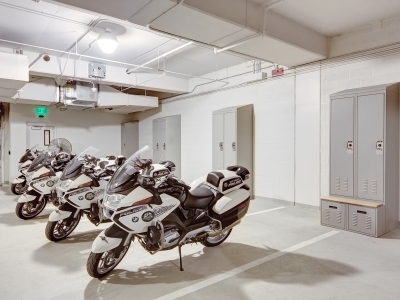 Locate gear lockers where they’re easily accessible, and our sturdy design will ensure security. 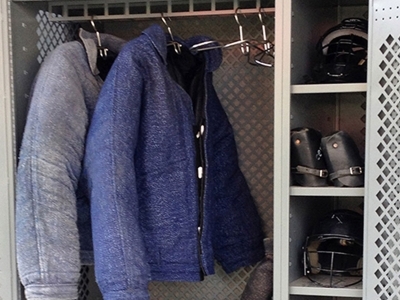 Spacesaver’s bite suit lockers are made of perforated steel to keep bite suits, helmets, and other training gear secure and well-ventilated. Our engineers can design custom solutions for any type of gear.